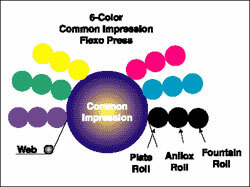 The common impression (CIS) is a very common type of press used by the Flexo industry. This press is made up of one large impression cylinder with the printing units around it. 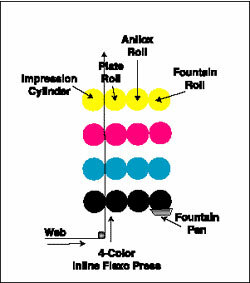 Each printing unit consists of an Fountain roll, Anilox roll and a plate roll. As the cylinders rotate, the substrate is fed between the plate cylinder and the common impression cylinder so that an image will be placed in the same position on every piece. To adjust the pressure for weight or thickness of the material being printed, each printing unit can be adjusted toward or away from the common impression. The web of paper or substrate travels around the common impression cylinder, passing under one or more of the Flexo printing plate cylinders. The advantage of a CIS press is that the paper or other substrate will have a uniform stretch around the large impression cylinder. This uniformity makes obtaining proper register and keeping register consistent much easier than it is on an in-line press. Another popular type of flexo press is the In-Line Flexo Press. The in-line press is configured either in a Vertical (as shown in the picture to the right) or Horizontal arrangement. Unlike the Common impression type press, each printing unit has its own impression cylinder, however, the web still passes between the plate cylinder and the impression cylinder. In-line presses will have heatset ovens to dry the ink between the printing units. Many vertical in-line press will also have dryers following the printing units. Sheetfed offset also will utilize the common impression system with 2 printing units around one impression cylinder. The MAN Roland 200 is such a press.